The Albedo-Warming Potential is an attempt to quantify the additional warming from a lower ice cover at the poles. At the moment these calculations don't include cloud cover, therefore it is called "Warming Potential" and not actual warming. However, over six-month weather tends to average out and warm areas correlate well with low ice extend in September. The basis of all calculations is a self-developed global surface radiation model and NSIDC Sea Ice Concentration data. It is in essence a much better version of my “Quantifying albedo effect / Rating daily area values” topic. In order to present the results better I created my own website and only use links on the forum. If I update my calculations all changes will be applied to this first post too and not scattered across several posts. The following images are all cumulative results from the last day of the melt season. The end of the astronomical summer to be precise. For daily Animations click on the link below the year. All daily values are also available on my website. All anomalies are calculated against the 2007-2016 sea ice concentration average. Red indicates lower albedo and above average warming. Blue indicates higher albedo and below average warming. One extra day of peak insulation on open ocean is about 20 MJ/m2. One extra month of peak insulation on open ocean is about 600 MJ/m2. The model calculates the incoming solar energy per day per m2 for all latitudes between 40N and 90N (0.2 degree steps). Considered are solar zenith angles, the atmospheric reduction (Air mass), Projection effect and water albedo for every 15min interval. If a grid cell has 55% ice concentration, then it is treated as a water area 55% the size of the grid cell. Cavalieri, D., C. Parkinson, P. Gloersen, and H. J. Zwally. 1996, updated yearly. Sea Ice Concentrations from Nimbus-7 SMMR and DMSP SSM/I-SSMIS Passive Microwave Data, Version 1. [indicate subset used]. Boulder, Colorado USA: NASA DAAC at the National Snow and Ice Data Center.http://dx.doi.org/10.5067/8GQ8LZQVL0VL. Beautiful. This is one of the big impacts of sea ice loss - quantifying it is highly important. What are the start and end dates for the calculation? Assuming you mean to continue this wonderful resource in the future, preferably the baseline should be fixed and not incorporate each new year into the average. Since you mentioned "the poles" at the top of your post, I am wondering if you have any plans to do Antarctica as well? Deniers keep talking their BS of how global sea ice is fine even when the Arctic is at minimum. But of course, winter sea ice at the south pole does not compensate for missing summer sea ice at the north pole in terms of albedo and energy imbalance. Yes cloud cover is the next logical step, but there are lots of different cloud types. Some are warming, some are cooling the surface and even professional climate scientists rate clouds of the biggest uncertainty in climate models. The chance that I get it perfectly right is very low. The start and end dates are 20th march and 21st september. This is the whole astronomical summer. When you follow the link to the daily animations you can see the dates as well. Calculating the same for the Antarctic is no problem. I just need to download all concentration files/masks and change a few lines of code. What timeperiod do you have in mind? For Antarctica there isn't a polehole and I'm not aware of any significant changes. Same time period should be fine. I think Antarctic solar pattern is somewhat different due to variation of distance from the sun. I'm sure you've got that straightened out. The variable solar constant from our eliptical orbital is considered for the Arctic as well. I can't exactly consider the same time period because the Antarctic melting season is shifted by half a year. For a complete decade I have to start with 2006/07 and end with 2015/16. For the Antarctic the melting season doesn't align as nicely with the astronomical summer like the arctic does. Should I just ignore it to keep both models consistent? I'm hardly an expert on this subject (or any subject on this forum TBH), but it seems to me the astronomical summer should be the appropriate period, as this is approximately when insolation is the major driver of heat accumulation, winning over heat loss to space. I added the typical graphs to my website as and the first post well. I did some minor improvements and accounted for the fact that snow/ice doesn't have an albedo of 1.00 All values are now compared to snow and roughly 20% smaller than before. As Oren requested I did the same calculations for Antarctica as well. I will post a seperate thread there soon. Thanks Tealight for your great work. The graphs are amazing. I think this year's results are now reflected in the very poor refreeze. Too much heat was accumulated too early. Tealight, are you already factoring in the cloudiness of each day, (and hence you get these large day-to-day variations or they respond to other cause?). Looks really awesome. Really showing some reasons why 2016 is ending in super late refreezing of the whole Pacific side. Wow 2016 is/was another black swan! Thanks for these very interesting graphs Tealight! Are the different regions weighted for area, or are the units just in KWh/M2? If the latter, it would be really interesting to see a chart that multiplied the albedo cumulative forcing by the area of the region, and then put all the regions together, so we could see how the regions stack up relative to each other in terms of overall energy gain. Yes the spring heat is now heavily impacting the refreeze. In July I already predicted it on the "Quantifying albedo effect" topic. ... Most of 2016 high energy came during spring, when meltponds were absent. So mainly into increasing water temperature in the marginal ice zone or simply prevent refreezing. 2012 on the other hand had high anomalies during June-August. This was caused by melt ponds (high extent/area ratio) so mostly towards ice melt. I still didn't factor in cloud cover. What large day-to-day variations do talk about? On the daily graph are large jumps because each year starts heavy meltponding on different days and sometimes they partially refreeze. Warming due to low ice concentration is pretty consistent. The units on the link you are refrering to are in KWh/M2 as well. It is not weigthed for area, but it is corrected for individual pixel area. I just updated these graphs to match the regional graph design. My calculations only compare energy gain relative to average sea ice cover and not overall energy gain per area. I believe it is more important to look in what regions a year has high warming than just comparing energy values. For example the Sea of Okhotsk and Hudson Bay have quite a large area and high ernergy values due to their lower latitudes, but they are almost irelevent for the September minimum. The Beaufort Sea and in general the whole Pacific side of the Arctic Ocean have relatively small areas, but are essential for a low September minimum. Sorry I explained myself as poorly as I undestood it. The fluctuations I talk about are the ones present in your plot I attach. It is due to daily concentration variations only then. Yes, thanks for these very important graphs and analysis, Tealight. From this one, it looks as though we passed a crucial tipping point in 2010. I don't remember anyone noting this, even though it is arguably as important as the much discussed 'virtually ice free' moment. Arctic albedo going from cooling influence to warming one seems like kind of a big deal, no?? I've seen on the Arctic News blog that the IPCC expresses the radiative forcing of CO2 in W/m2. To better compare my values with this one I converted my final cumulative energy values into W/m2 for the Summer and for the whole year. On its own a doubling of CO2 would amount to a radiative forcing of 3.7 W/m2. The table below shows the highest regional values for 2016 compared to the 2007-2016 average. Compared to the 1980s all values would be higher. So even if we half the values to account for cloud cover the albedo already has a higher impact than a doubling of CO2 would have. Would we be able to calculate the negative impact of albedo changes due to additional NHEM snowcover during autumn? On Land there are too many ground types and trees keep the albedo low even if the ground is covered in snow. Below is a calculation of average image brightness for different terrain types. All land images are taken from Worldview on the 31/10/2016 near Lake Baikal. I get what you are saying but I think you inverted my position accidentally? In fact, the plains would have *deeper* snow now than other years enhancing the albedo. Now obviously we do not need exact calculations but if we could approximate the albedo impact of +2SD NHEM snowcover in Sep/Oct it would be very illuminating regarding what the *total* impact of near-ice-free Arctic is as despite popular perception, it does result in ++++snowcover anomalies across the NHEM, at least in autumn. 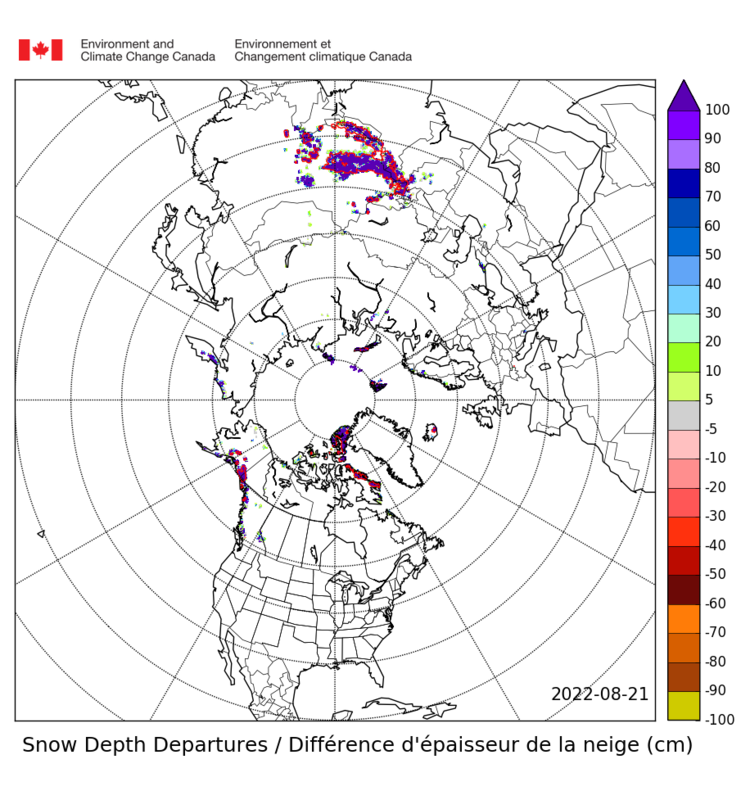 PS... my very rough calculation is that we basically have a Canada's worth of surplus snowcover at the moment... that is about 6.5% of the global land surface area. Excuse me if I am missing something here, but I thought the problem with feedback was from times when Albedo or reflectivity are low and thus things absorb more energy from the sun. I thought it to be a good thing to have a thick snow cover with high Albedo to reflect the energy back into space, considering clouds don't trap it and send it back. Yes, it is a good thing to have a thick snow cover with high albedo, but when that thick snowcover is double the size of what is used to be in extent (and also thicker), you can see how the reflectiveness issue leaves Earth with much less heat... technically we never left the ice age...! The increase in snow cover in October seems to be part of a larger trend. It was at the same levels as we are today during the 70's, then it drop down during the 80's to pick back up again during the 00's. It seems like the same thing happened throughout the North hemisphere. For the spring months is the opposite. Snow cover has decreased steadily across the board. Choose 2015 for the end year and switch between October and April to see the data for those months. Notice that parity is achieved around March, with declining snow cover until July. I explain the increase of snow in october to much more water vapor due to climate change. That snow will melt really fast come next spring. Once the arctic has fully melted that snow will switch to rain, except for rare occasions. Add to that the same type of blocking patterns that cause excessive rain in some places and droughts in others. How do what's considered snow-covered in today's terms compare to years in the past. Many times in the past, a snow covered plain would be so deep you couldn't tell where it ended, and it was blinding. This doesn't look very deep, which shows what bbr is saying to be true. On snow cover maps this plains region was considered to have 5-10cm of snow. The forest image had 10-15cm snow according to the map. This shows our problem with insufficient data. If a region with thicker snow cover can have a lower albedo than a region with thinner snow cover then any calculation is just a guess into the blue. I attached a graph showing the daily energy value that gets absorbed by the ground for different albedos. If you compare these to the radiative losses it should be clear that they are a lot smaller and the difference comes out of the ground, lakes or from further south. Edit: The atmosphere absorbs some energy as well. For total radiative balance the ground value should be multiplied by 1.1 or 1.2. PS: Please don't use phrases like it is good or is bad. Once the sun goes down permanently in the north, the emissivity of water is a strong negative warning potential, due to the energy imbalance. Would it be possible to update charts to show the net effect of the unprecedented area of open water that currently exists? just as a little "YES i agree" but: under circumstances water can have different colors up to light blue, red or green etc. algae, sedimentation and other factors which we cannot yet exclud to pop up in the future due to ever warming oceans. i have nothing specific in mind and don't know enough details but it has happened in the past that areas of seawater got "colored". I'm not quite sure what you mean with "updating the charts". The net effect of open water is a completly different calculation. Do you mean the charts in my top post or in my "Reply #27" ? I did some crude calculation of what the energy values mean for refreezing. The Beaufort for example had +80kWh at the end of September. With a clear sky loss 5kWh per day the extra energy could keep the ocean 16 days longer ice free than the 2007-2016 average. However the Beaufort was an extreme example and the Arctic currently receives plenty of heat from further south to keep the ocean open. On my area graph 2016 is about 17 days behind the average. You are of course right. Algae could develop on open ocean. Sediments are limited to the coastlines which are masked out by the NSIDC. Is this what we see also now develloping? Hello. I know that my questions are sometimes stupid and I want to thank Tealight for answering them beautifully. That said, here goes another one. Lately, I have been wondering, what would the maximum albedo warming potential be in a completely hypothetical situation of 0 arctic sea ice from March Equinox to September Equinox? For example, If the arctic ocean was at 0C in March, with no ice cover, what would the potential surface temperature be by September if all other considerations are ignored? If the albedo effect is delayed....I assume you mean the effect is delayed on the transfer of heat from the ocean to the atmosphere from the ocean is delayed. So.....the additional heat that is now being absorbed by the southern oceans....the largest effect on the atmosphere will be during the Southern Hemispheres winter....which will be our summer (July, August, September). Do I have that right? That an interesting question and not a stupid one. I can't tell you what the exact temperature will be, but I can run my simulation for zero ice extent. Most likely the temperature will be similar to the northern Baltic sea or the Barents sea just north of Norway. I already did a simulation for a theoretical minimum of ice concentration from all years. Archimid was talking about the Arctic. I did run my model for this melting season in Antarctica and it is already in first place for cumulative value. That said I don't feel my model is as valuable for Antarctica as it is for the Arctic. I plan to add a daily updated page on my website for Albedo-Warming Potential as well. It would switch hemispheres in April and October to always show the correct melting season. @Archimid....I was just seeing if my thinking on the issue of albedo effect "lag time" was correct. This is the first time when so much of BOTH ice sheets are gone....and it will be interesting to see what the SHORT TERM effects are on atmospheric warming. I don't imagine it will be anything that any of us will like. That an interesting question and not a stupid one. I can't tell you what the exact temperature will be, but I can run my simulation for zero ice extent. Most likely the temperature will be similar to the northern Baltic sea or the Barents sea just north of Norway. Yeah, I see it better now. I looked at ocean temperatures around the peripheral seas and assumed an arctic without sea ice would be of similar temperature, but probably colder. That is of course assuming albedo is the only variable, which is not. I am starting to believe it is the most important one. At least more significant than greenhouse gases. Yep that answers my question and produces other ones. That is the minima from the 2007-2016 average, right? If so, it would be interesting to see the minimum of Minima from the 1980-2000 average. The difference between the two should be significant. David, you owe me a cloth to clean my screen. ...I did run my model for this melting season in Antarctica and it is already in first place for cumulative value. That said I don't feel my model is as valuable for Antarctica as it is for the Arctic. I plan to add a daily updated page on my website for Albedo-Warming Potential as well. It would switch hemispheres in April and October to always show the correct melting season. I would be interested in such an updated graph for the Anarctic, not because of the sea ice itself, but because of potential feedback effect of a warmer Southern ocean on glaciers and ice shelves. Why do you want the Minimum of Minima from the 1980-2000? Wouldn't it be better to compare the average of these two time periods? To get a daily updated graph I don't have to write much code. Around 80% is already there and just has to be copied into a new file. The problem with that method is that it is very inefficient, because the calculation always starts at the 20th september I don't like it when my computer spends 10min calculating the same stuff every day over and over again. Maybe I can spend some time next weekend and create a new logic which reads the cumulative values from the previous day and updates the file with the current day. Then the calculation time is only 3-4 seconds. Maybe ... a new logic which reads the cumulative values from the previous day and updates the file with the current day. Then the calculation time is only 3-4 seconds. Sounds like a good idea. Otherwise it does not scale well. I finished programming the new logic and graphs for daily updates. The presentation still requires some refinement, but I already uploaded them for enjoyment. The graph looks scary, but this was partly expected when you compare a record low year with a relative high 10 year average. Maybe I should add 1986 and 1993 as two other low years for comparison. It sure as hell does! I wonder if this will have any marked effect on glaciers and ice shelves as the Austral summer progresses. Both are quite interesting compared to recent years. 1986/7 had lots of ice near West Antarctica and very little pretty much everywhere else. 1992/3 had a more similar ice distribution to recent years, but with extreme low sea ice cover in the Weddel Sea. On the daily graph 1986/7 shows a zigzag curve because sea ice concentration could only be measured every second day. I was trying to visualize the effects of insolation on the shrinking arctic and I found this nifty tool. I didn't know where else to put this, but I think it is relevant in this thread. This app lets you select latitude and day of the year and it gives you a nifty graph. Archmid - I like the daylight hour tool. I found: https://www.timeanddate.com/sun/ which shows the different twilights too (Civil, Nautical and astronomical). Sadly though you have to enter a place, country and though it has South Pole - no North Pole - no land? Looks like the Astro one is the full daylight, but there is a large factor of partial sun during the twilight hours - I dont know how Albedo warming is affected. I used this app on my phone for the past 3-4 years. It's pretty great if you want to know more details like time of Sunrise and Sunset. The widget updates every minute or so. During twilight the sky is illuminated, but no significant amount of sunlight reaches the surface. I found this paper from Taylor that seems to show that the possibility of cloud generation from open waters in the arctic is much higher in the fall than in the summer. Allowing the low albedo waters to take the heat in during the summer, then trapping the heat with more clouds in the fall. "There's no cloud response in summer to melting sea ice, which means it is likely that clouds are not slowing down the Arctic climate change that is happening—clouds aren't really providing the expected stabilizing feedback," Taylor said. "The fact that you are melting sea ice and uncovering more ocean and the fact that clouds don't increase during summer means that they are not buffering or reducing the rate of the warming, which implies the Arctic could warm faster than climate models suggest." So the increased energy imbalance from the reduced arctic albedo is not buffered by increased clouds, given the numbers involved this could be huge miss for the models.